My mother-in-law introduced me to Strawberry Soup. The first time she served it to me, I liked it so much, I had three servings. This is a dessert soup, easily made with fresh strawberries, sugar, yogurt (or sour cream), and cream (or milk). Best made when strawberries are in season. That is when my mother-in-law would make it. In the summer, with strawberries that she had picked at the local strawberry farm. When making this soup you can use a food processor or you can make it by hand. The important thing, if using a food processor, is not to over process the strawberries. You don't want a smooth soup, you want it kinda chunky with lots of bits and pieces of strawberries. To make the soup wonderfully rich and creamy we add some plain yogurt (or sour cream) and cream (or milk). I like to add a squeeze or two of lemon juice which adds a nice tanginess and really highlights the flavor of the strawberries. You can also take extra strawberries, cut them into bite sized pieces, and add them to the soup for more texture. It is better to make this soup several hours in advance so it has sufficient time to chill. But wait until serving time if you want to garnish with a dollop of softly whipped cream. Strawberry Soup: Wash and cut the strawberries in half (or quarters if using large strawberries). Place in your food processor and pulse just to break up the strawberries. Then add the sugar, yogurt, milk, and lemon juice and process just until combined. (You do not want a smooth soup you want there to be small chunks of strawberries in the soup.) Adjust the ingredients to taste. You can serve the soup immediately, but it's best if you cover and chill in the refrigerator for a few hours before serving. 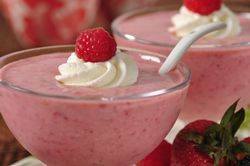 Ladle the strawberry soup into dessert bowls and garnish with a dollop of whipped cream or sour cream, if desired. Makes about 3 - 4 servings.